By buying this product you can collect up to 214 bonuspoints. 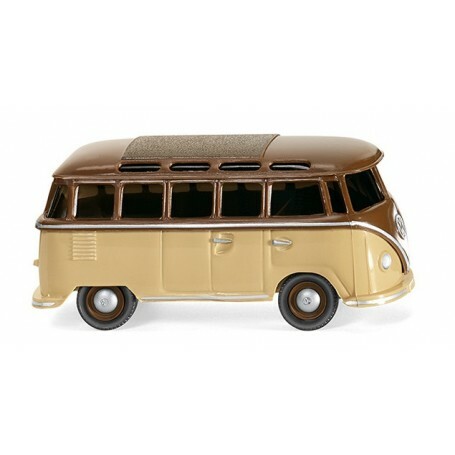 VW T1 Samba bus - beige/brown, 1963. Lower chassis part beige, upper chassis part fawn. Glazing tinted topaz. Fawn hubcap rims with silver ornamental trim. Folding roof imprinted terracotta, front VW logo, as well as ornamental strip in silver. Rear silver ornamental strip, as well as tail lights in carmine red. Side ornamental strips and door handles in silver. Bumpers with silver ornamental line.